The big game is just a few hours away. Whether your favorite team made it to Superbowl XLVI or not, it's still a great excuse to have a party. You've picked out what you're going to serve at the party and you've placed your order to have it ready for game time. But what are they going to eat off? You might have enough dishes, but imagine the pile up in the sink that will definitely have you missing the game pile ups as you wash a seemingly endless offensive line of dishes. Fortunately, party disposables from Fineline Settings are here to save the day and make your party much easier. With disposable dishes, all you have to worry about is, the fun, food and game. Party disposables aren't just the old paper plates that everything soaked through. 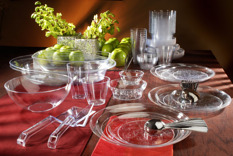 Our disposable dishes come in a huge variety of shapes, colors, styles and sizes. They'll even fit your budget. When you use party disposables, your cleanup becomes instantly easier as you simply dispose of the dirty plates, napkins, disposable tumblers, etc. So you have a Superbowl party this weekend, a wedding shower next weekend and then a big wedding all coming up? Don't stress about broken dishes, deposits or raisin fingers. Disposable party plates from Fineline Settings can fill every presentation niche and plasticware need you've got. You can snag Superbowl series party disposables complete with everything you need for serving, storing and transporting with our platter lid. Our collections are also available for catering and events where you'll need everything from clear salad bowls and trays to pitchers, disposable utensils and ice buckets. And for that magical wedding day, don't worry because there's now a silver flatware collection that feels completely real, but it's still a party disposable! While the guys on the field may be rushing, running, reversing and carrying, you'll be doing the same thing at your Superbowl party, made easier with party disposables from Fineline Settings. 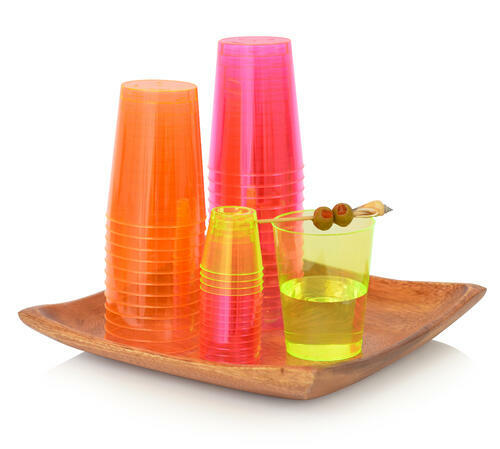 Fineline Settings introduces a new line of Savvi Serve Neon Tumblers. These disposable dishes are beautiful, practical and affordable. They are the answer to your desire for an affair that allows you to impress for less and please with ease. Add that color pop at you next party or affair with these Neon Tumblers from Fineline Settings!